We cordially invite you and your family for the most auspicious occasion of the abhishek installation of the Guru Parampara in Klang on Sunday 12th October, 2008 corresponding with Dvadasi Gaura Paksa Padmanabha Masa Gaurabda 522 at Iskcon Klang at 6.15pm. This day also coincides with the disappearance day of Raghunatha dasa Goswami, Ragunatha Bhatta Goswami and Krishnadasa Kaviraja Goswami. We are very fortunate to be the first in Malaysia to get this set of fiber optic deities of our Guru Paramapara to be installed on our altar. 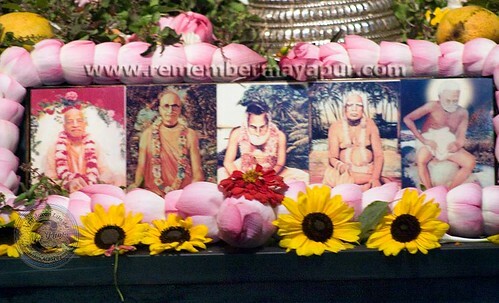 The Deities include Srila Prabhupada, Srila Bhakti Siddhanta Saraswati Thakura, Srila Gaura Kishora Dasa Babaji Maharaja, Srila Bhaktivinoda Thakura and Srila Jagannatha Dasa Babaji Maharaja. Do not miss this rare opportunity and be soaked in the transcendental mercy of our guru Parampara.